Large boulders which are actually sandstone concretions sit across the landscape in Red Rock Coulee National Area in Alberta, Canada. The Red Rock Coulee Natural Area in Alberta, Canada is a step back into time where boulders such as these are made from sandstone and were created in prehistoric seas. These reddish colored rocks started out as something simple like a leaf, shell or bone and layers of sand, calcite and iron oxide began to form around them. Over the years, large red sandstone creations have been made. 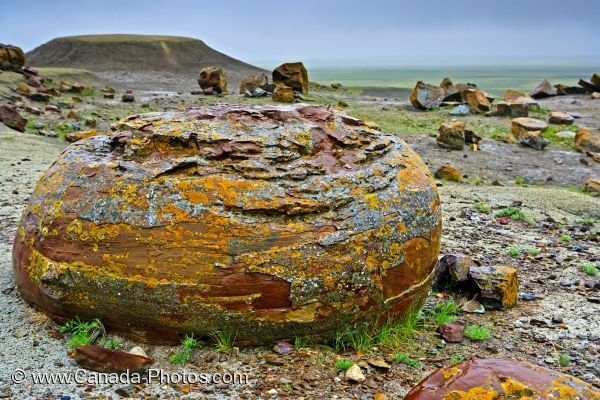 Picture of a large sandstone concretion in Red Rock Coulee Natural Area in Alberta, Canada.